It was in the summer of 1954 that your contributor snapped this Talbot. The location was Blackpool’s ‘prom’, and I had been taken there to watch the driving tests that concluded a rally – an event for then-‘modern’ cars, of course. The passing Standard Vanguard endorses the date – as does the dearth of traffic. The Vanguard then would have been a new car. Should you wish to cross Blackpool prom these days, you might be able to survive a lucky sprint between 3 and 6am on a Sunday. My father had taken me, and he was excited as I was by the parked non-competing Talbot, as a distant cousin of his had owned a team Talbot 90 and raced it for a couple of seasons at Brooklands and elsewhere. He remembered a stirring ride as a young man in that fast car. Maybe he was even more excited than I was, as the run-down condition of the Talbot JJ93 offended my youthful vanities. Tatty paintwork in cardinal red (one coat of Valspar, without any doubt); the unmatched headlights; bald tyres; cracked windscreen glass… But still an impressive car with a business-like presence. In 1942, a man by the name of Peter Earle who had owned this same car in 1938 wrote to The Autocar about it. Painted the traditional apple green and olive on purchase, he had it recellulosed in black. The special ‘Eldridge’-like radiator cowl replaced the standard Talbot shell and, as I remembered, the name ‘Talbot’ was spelled out vertically below the filler cap, nicely done. Peter Earle commented on the very comfortable seating and also on the light construction of the coachwork. Performance came in for praise with 100 mph touched on occasions; and impressive acceleration. Steering and road-holding were regarded as less good, he feeling that the car was too light at the rear, whilst admitting that he had never actually ‘lost it’. Over-heating had been a constant problem too: the aperture of the cowl isn’t over-generous. “In 1934, Dr John Roth, a Harley Street specialist, ordered a one-off Talbot 105 from Clement Talbot, intended for racing at Brooklands. It was built on a standard AV105 chassis, but with various ‘special order’ items, such as Andre Telecontrol dampers and Zeiss headlamps. The coachwork was made at the Darracq works at Acton, part of the STD combine responsible for standard Talbot bodies, and it was similar to the three ‘BGH’ Alpine Trial team cars made at about the same time – but again there were differences to reflect its intended use. Unlike the ‘BGH’ cars, it had no windscreen or hood, and no door. The area where the hood was stored was panelled over and a tonneau cover and two aero screens were all the weather equipment. This car was registered AYL2. “Dr Roth raced it at Brooklands, not particularly successfully, during 1935, but a more ambitious programme was planned for 1936 with a works-backed attempt on the 1936 BRDC 500 Miles Race. This involved rebuilding the car with a single-seater body made by the team who made the E.R.A. bodies and fitting one of the 110 engines developed for the Brooklands exploits of BGH23. Drivers were to be Chris Staniland and Mike Couper, both very experienced and successful, so it was a very serious attempt – but it was unsuccessful. 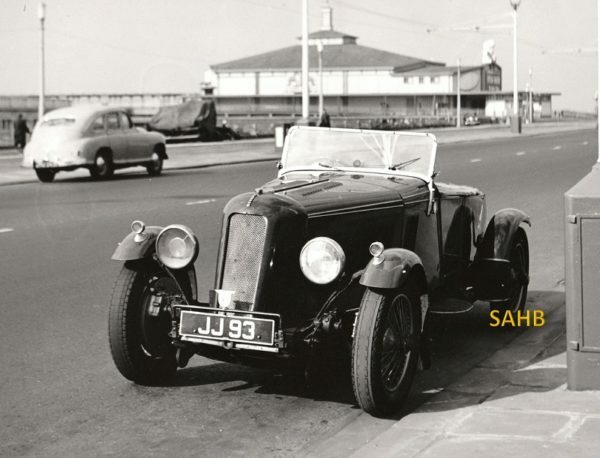 “The lightweight racing body which had been removed was then fitted to a second hand 1933 Talbot AV105 chassis registered JJ93, to make the car you snapped in Blackpool. At this stage, it was fitted with a door, like the ‘BGH’ cars, and a non-standard full-width windscreen, both of which the body retains to this day. The next owner known to me was a Rex Lepard of Hove, who owned it in the 1960s, at which time it was painted Talbot ‘team car green’, and had been fitted with a conventional Talbot radiator shell and lamp bar. The last owner of the car in this form was Paul Wignall, who sold it to John Ruston about 3 years ago. “Meanwhile the single seater had a not-very-successful Brooklands career. After the war, it was rebuilt as a two-seater sports car and re-registered JKJ869 (I think). It was sold to Arthur Archer as a non-runner and I bought the chassis and some mechanical components in the 1970s. I sold these parts to a man in about 1985 who built a replica of the original AYL2 body but was unable at that stage to recover the original registration number. The car was subsequently owned by Nicholas Ward in Northern Ireland, and it was he who eventually recovered the original registration number. Many thanks to Ian Polson for his authoritative input.